The completion date for the Olympic Stadium's planned $250-million roof replacement is being pushed back a year, so officials can get it right this time. The completion date for the Olympic Stadium's planned $250-million roof replacement is being pushed back a year, officials say, to make sure they get it right this time. "The first two roofs did not work," Maurice Landry, in charge of construction and maintenance for the Régie des installations olympiques (RIO), told Radio-Canada. In 2017, the Quebec government approved the quarter-billion dollar budget for a new roof, to be installed by 2023 — leaving Montreal with time to spare before the city plays host to some of the 2026 World Cup matches. "Obviously, we will try to respect the budget and the schedule," said Landry. However, he said, the focus must be on quality. The stadium that's dominated the skyline of Montreal's east end for more than 40 years had no roof when the 1976 Olympics were held — the tower meant to hold it up wasn't finished. The Kevlar roof, designed to be retractable, wasn't installed until 1987, and it ripped so often, that by 1992 — a year after a windstorm left a gaping 30-metre-by-15-metre hole in it — a decision was made to keep the roof closed at all times. 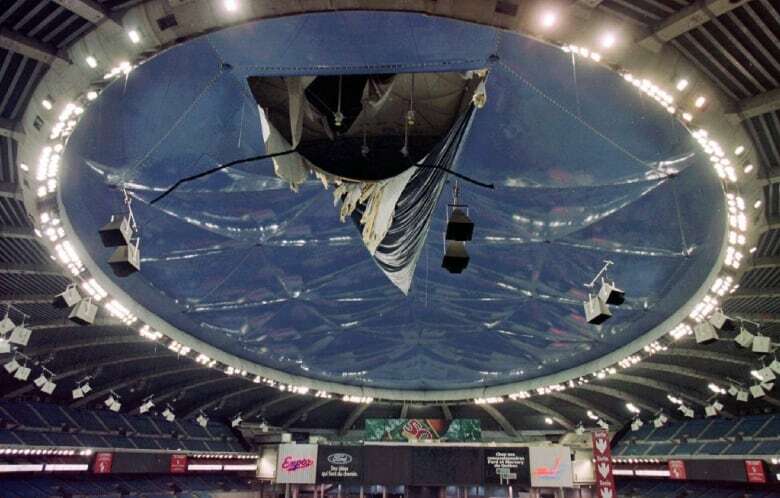 That roof was removed for good in 1998, making the stadium an open-air venue for several months, before it was replaced by a non-retractable, opaque roof later that year. The second roof proved no less vulnerable to damage — ripping 7,453 times in the decade between 2007 and 2017. The possibility of making the third roof retractable once again is under study, Landry said. Exposing the field to sunlight would allow real grass to grow there under optimal conditions. "Our specialists are seriously looking into this solution to see if it is technically feasible, and at what cost we can do it," said Landry. Staying on budget is critical, however, he said. Gerkan, Marg and Partners (GMP), a German company that specializes in constructing stadiums, has been working with RIO officials to figure out the best solution. GMP is behind several major stadium projects around the world, including BC Place in Vancouver. The aim is have a plan ready to be able to put out a call for tenders in 2020. Whatever the final plan, it cannot detract from French architect Roger Taillibert's original design, the minister responsible for the RIO, Caroline Proulx, told Radio-Canada. Changing it would be ''as if you went to touch up the Eiffel Tower, but then took part of it away,'' Proulx said. Proulx said the goal is also to make sure the stadium can be used year-round. Right now, it must be closed for security reasons anytime more than three centimetres of snow accumulates on the roof. Being able to keep it open all the time would be a ''game changer,'' said the borough mayor of Mercier–Hochelaga-Maisonneuve, Pierre Lessard-Blais.